NicoStic Deluxe Starter Kit includes: (1) rechargeable NicoStic battery, (1) 4-pack of disposable NicoPods, (1) micro-USB charging cord, reusable storage box. 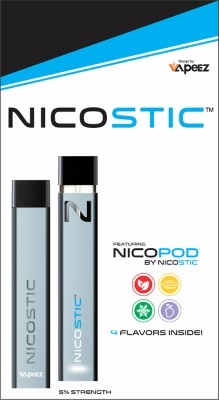 Includes (4) single Tobacco-flavored NicoPods™ for use in NicoPod™ device. Each NicoPod™ contains 1.1ml of e-Liquid in 5% strength. From Julia of Indianapolis, Indiana on 1/20/2018 . Product is easy to use. Great flavors.